Israel reinforced its Syrian frontier on Thursday as fighting between rebels and the embattled regime of Syrian President Bashar al-Assad intensfied on Thursday. "The IDF is reinforcing the fence between Israel and Syria by adding more barbed wire," a senior security official told AFP, indicating that it was motivated by "fears that refugees from the Syrian side could cross it." 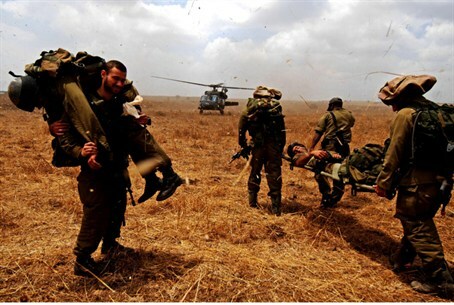 Israeli troops were put on "very high" alert, the source said, speaking on condition of anonymity. "The state of alert is very high. A lot of soldiers have been moved to the area, officially for training, but they will be there if anything big happens," he said. "There are also more planes and more snipers." A second security official confirmed the move to reinforce the ceasefire line, but said it was motivated by concern that terrorists could use the chaos to cross into Israel. He denied the move was linked to fears that the Golan could be flooded by thousands of Syrian refugees, insisting that Israel would help anyone whose life was in genuine danger. Since the turmoil in Syria began 17 months ago, tens of thousands of refugees have fled for Turkey, Jordan and Iraq. Last week, following a series of deadly battles that ravaged the capital of Damascus, 30,000 refugees were reported to have escaped the country. The move marks the second time in as many months that Israel has increased the number of troops on its Syrian border due to increasing instability in the neighboring country. Last week, some 500 Syrian troops and 50 military vehicles violated Israeli territory and briefly enteted the Golan Heights. Israel filed a formal complaint with UN secretary general Ban Ki-moon and the UN Security Council over the incident on Monday. Israeli officials have expressed concern that Syria's chemical and advanced weapons systems could fall into the wrong hands should the Assad regime collapse. Jerusalem has vowed to move to secure those weapons should officials conclude they are at risk of falling into the hands of Assad-ally Hizbullah. Government forces in Syria took over a week to put down a rebel push into the once-impregnable regime stronghold of Damascus, ultimately employing helicopter gunships to accomplish the task. Meanwhile, thousands of rebels are streaming into the now-contested city of Aleppo, Syria's key economic and population center, as government forces mass in preparation for a counter-strike.